Just a few months back it was a schoolboy's beard that was at the centre of a controversy. Now it's headscarf that is generating a debate. A college in Karnataka's Mangalore district has ruled that the headscarf is unwelcome. 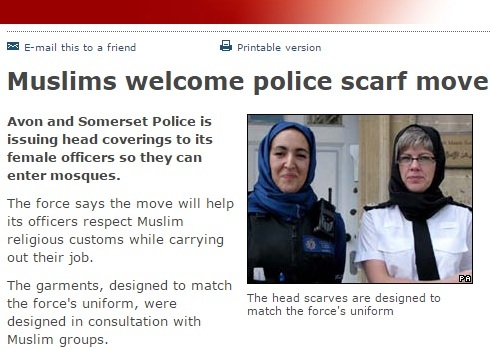 This is in sharp contrast to what British police authorities recently did: designing hijab for policewomen. British policewomen wear headscarves, Indian Muslim student gets banned! The British are surely going extra mile even though the Muslim population in England is just 2.4 million [24 lakh] or 3% and their country doesn't have an Islamic heritage of more than a century. There are districts like Moradabad (Uttar Pradesh), Malappuram (Kerala) and Murshidabad (West Bengal)--each having more than 24 lakh Muslims. That's to give an indication of our Islamic population in a country that has 800-odd districts. However, it's not about population. Here in India where Islam is as much part of our culture [and an Indian religion] for over 1200 years, and where even burqa is part of social life and customs, the denial of hijab or mere 'headscarf' does appear excessively insensitive. Strangely, what happens far away in West, seems to find its echo in a more pronounced form in India. However, we have a penchant for controversies. The college authorities had no problem with hijab when Ayesha took admission. There was no rule to prevent her from wearing the scarf but the principal later made a false claim that it was mentioned in the rules. The pressure of a section of student leaders led to change in the stand. The girl, Ayesha, however had confronted the student leader and had retorted that she would not stop wearing the scarf. She even outwitted him by saying that she had no problem wearing a saffron headscarf. Initiallly, the girl was asked not to wear headscarf to class. Later she was told that it was not allowed even on campus. Then she was followed and there were vulgar comments, even physical attacks. Even lecturers were unhelpful and often sarcastic. And the incident at SVS College Bantwal is not a solitary case. This is happening across the colleges in Dakshin Kannada district and elsewhere. Tehelka correspondent Sanjana's report sheds more light on it. The college principal later said that under no circumstances the girl could be allowed to set foot on the campus while keeping her head covered, as it was against the college's 'dress code'. The Sri Venkataramana Swamy college is located in Mangalore district. In the last couple of years, the City that once known for its tolerance and affluence, has seen communal riots and rise in tension among Hindus, Muslims and Christians. Read an earliest post on school imposing ban on beard. More on Mangalore soon, in another post. Exactly a century ago, a pioneering revolutionary and freedom fighter, Madanlal Dhingra, was hanged in Britain. He was just 26. The young and bright, Madan Lal Dhingra, had fired five shots at Sir Curzon Willie, at a gathering in London. The daredevil assassination of a British official outside Indian soil, had caused ripples. Willie was killed on July 9 and after a speedy trial, Dhingra was hanged on August 17, 1909. Today Dhingra's act may seem reckless or foolhardy and he may be termed a militant, but he was a hero to the generation of early freedom fighters including Chandrashekhar Azad, Bhagat Singh and the entire generation of freedom fighters. India was subjugated then and there were no signs of any change in the condition of the masses, due to the repressive policies of the British government. He knew the adage, 'One man's freedom fighter, another man's terrorist', too well. But Dhingra wasn't a militant. He belonged to a generation for which 'slavery' was the biggest curse. He had gone to study Engineering but came in contact with revolutionary activists and ultimately shot dead the political aide of the Secretary of State for India. When brought before the magistrate, he said, "I do not want to say anything in defence of myself but simply to prove the justification of my deed. As for myself I do not think any English law court has any authority to convict me or detain me in prison or to pass any sentence to me. And I maintain that if it is patriotic for any Englishman to fight against the Germans if they were to occupy this country, it is much more justifiable and patriotic in my case to fight against the English. I hold the English people responsible for the murder of eight million of my countrymen in the last 50 years. And they are also responsible for taking away 100 million pounds every year from India to this country. I also hold them responsible for the hanging and deportation of thousands of my countrymen." Dhingra's statement before he was hanged, is also historic. It is oft-quoted and inspired the later revolutionaries. He said, "I believe that a nation held down by foreign bayonets is in a perpetual state of war. Since open battle is rendered impossible to a disarmed race, I attacked by surprise. Since guns were denied to me I drew forth my pistol and fired....."
The sentiments aren't surprising if one considers the hurt and the desperation among Indians in the era. Congress was yet to become a major political force and the end of the Raj was nowhere in sight. Dhingra was hanged just a year after Khudiram Bose was sent to gallows. Even after death, his body was denied a proper Hindu funeral. His family had disowned him. And it took nearly seventy years before the mortal remains were accidentally located and brought back to India. Dhingra died when Bhagat Singh was barely two years old. However, along with many other revolutionaries and freedom fighters, today he is also a nearly forgotten name. Even the hundredth death (martyrdom) anniversary passed without a mention to the revolutionary. As India celebrated Independence Day, it is more pertinent for us to remember these sacrifices. The police cornered the person and asked him to stop, but he didn't and instead fired at police. While no jawan got injured, the person died in the exchange of fire. Chongkham Sanjit, 27, was killed near Assembly in Imphal, and that was the version of the police commandos of Rapid Action Force until a lensman, who had shot the entire sequence of events, exposed the lies. Initially, News weekly Tehelka published these photographs. Such encounters are common in North East, though they always don't make news, as they can't be contradicted and the citizens don't resent as long as the person killed is not 'related to us' or unless they can 'relate to him'. The magazine tells us that Salam Ajit Singh, Okram Ranjit Singh, Taslimuddin, Laishram Dipson and Ningthoujam Anand were also killed in similar encounters. One of them was a mason, the other was lorry driver, another a labourer and one of them was a rickshaw driver. Naturally, their kin can't be in a position to fight. The question is that why cops do it? There are numerous reasons ranging from personal rivalries, need to 'show' work by eliminating 'goons', the desire for rewards and gallantry medals, instilling sense of fear among others for easy 'earning' (extortions) and often just the urge to do it because they have tasted blood. Less than a month ago, Ranbir Singh, an MBA student, was killed in an encounter in Dehradun, the capital of Uttarakhand. A probe was ordered after much hue and cry though the news channels had initially accepted the police version and termed him a militant. Had he been Shabbir instead of Ranbir, there wouldn't have been an inquiry either. In that case, the degree would not have come to his help, as stories like 'techies taking to terrorism' would have been planted intelligently. We have one of the most inefficient, most corrupt and most brutal police force. The police force can't change. It can't become sensitive because it is governed by the same law and code that were devised in 1861 by the British to govern the 'natives'. There are castes, tribes and communities who were called 'criminal tribes' before independence and though they were de-notified, the police still treat the tribes like Pardhis as criminal. Children born in these housholds are seen as suspects from the day of their birth. And our polity & bureaucracy have failed to form a new police act. When recruits get into force, within months they understand that they are not in the force to solve cases of thefts or murders and keep the area's lawlessness under check, but they have to 'manage', 'sort out' things, keep working relations with gangsters and gamblers so that they keep paying 'hafta', keep musclemen in good humour and ensure that everybody who matters among the political class and well-to-do remain happy. If an offender wants to mend ways, he can't. Even if he is living a peaceful life, he would be arrested and interrogated every time for each incident of major crime, despite knowing that he is not involved in the crime. That happens because that's how the 'system' works. It doesn't treat poor [those who don't have connections] Indian citizens fairly. Justice is not delivered unless you are well connected. State governments belonging refuse to act on this issue. Every time the Supreme Court asks them about the model police code and the implementation of the recommendations for change. Politicians don't want a change. Bureaucracy doesn't want police to get out of its hand. The police remain an anti-people brute force in this country. It is not to serve the citizens as jan-sewaks but to serve the masters, who were Whites in the past, and have been replaced by the top brass that includes civil servants, filthy rich and well-connected. It has a licence to exploit and harass others. At last, LK Advani's autobiography has been published in Urdu. He wanted to appear in print much before the elections. But Advani couldn't get an Urdu publisher then. Most were reluctant to associate themselves with the book. Personally I feel the reason is that majority of Urdu publishers are now in business just because of sale of religious books, which are still sold in large numbers, rather than literature or other books--they might have feared reaction by associating themselves to Advani. Delhi-based Urdu daily Hindustan Express extensively covered the event. It says that when a prominent Muslim leader of BJP tried hard to convince a well-known Urdu publisher, he agreed but on the condition that the name of the publication house would not be printed in the book. Naturally, the idea was dropped because it was thought that if a book is published without publisher's name and address, it would look undignified. Telugu, Hindu and English editions of the book had been released during the ad blitz projecting him as Prime Minister. 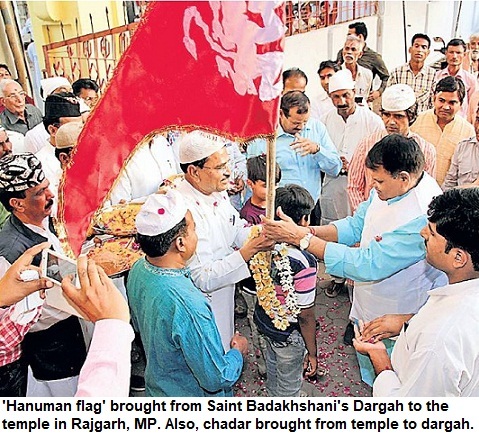 The aim was to reach out to Muslims but it couldn't happen. Now the book--Mera Watan, Meri Zindagi [My Country, My Life] has finally been released. 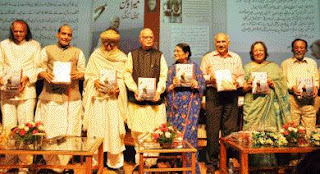 Speaking on the occasion Advani himself said that though the book has been translated in many languages, the Urdu edition has been the most important one and close to his heart. He also spoke on 'secularim', 'Hindu-Muslim harmon' and a lot. Journalists MJ Akbar, Aziz Burney, Poet Chandrabhan Khayal, Maulana Wahiduddin Khan, Najma Heptullah, Rajnath Singh and editor of Akhbar-e-Mashriq Waseemul Haq were present. At the function, Rajnath Singh, said that expressed his love for Urdu. Emraan Hashmi denied house in Mumbai: What government can do to curb communal societies and ghettoes? Bollyood actor Emraan Hashmi has said that he was denied a flat at Pali Hills in Mumbai because of his religion. He says that he was advised to buy it in his wife's name [she is a Hindu]. I have written several posts on this issue in the past couple of years. Yes, it's a major problem but it becomes a news when a celebrity says it. Shabana Azami said it once and it had generated a big debate. TV Actor Amir Khan [not the film star] had approached court when he was denied a house by a residential society. And now it's Emraan Hashmi. Frankly, he has fat pockets and can get a flat at ten other locations. His grievance is genuine but his victimhood may not elicit empathy*. However, it is a different matter that this is now a national problem and the real victims are poor and middle-class families. Not just Muslims, earlier it was the Sikh community that faced this problem [post 1984] and later other groups have also faced it. Certain groups also try to keep Bengalis, Christians and other [non-vegetarians] out. There are prejudices in our society and there is no limit to that. It's not just minorities, it's everybody--ranging from a North Indian in Maharashtra to a South Indian in North, or the North Eastern girls in Delhi. The only positive thing, which I can see in this controversy, is that the problem will get highlighted once again. But I don't expect the dumb politicians to do something about it. On NDTV, Rajiv Pratap Rudy was unwilling to listen. Salman Khurshid tried to tread middle path but had no solution. There was Shahid Siddiqui also on the panel but apart from the heated exchanges, nothing emerged of it. What the government can do? Personally I feel that the government can do a lot to change the situation. Can't they offer some privileges and concessions to such societies that will keep a few minorities (cultural and religious) as members. Besides, if government just offers 10% discount in registry or reduction in other taxes if the builder manages to have more than 10-20% people belonging to different communities. That's my suggestion. Surely the experts can come up with more and much better ways. It will stop the ghettoisation. And also lead to integration. There should be colonies where South Indians, Bengalis, Punjabis, Gujaratis live together along side. Unfortunately, there is a tendency that people tend to form their own ghettoes--some do it willingly while others are forced to do it. For example in most cities there is a trend that a community, say, Kayasthas would go for a colony where all Srivastavas, Saxenas, Nigams, Bhatnagars would live and also have a Chitragupta Mandir. Similarly, many of the Gujaratis, the Jains, the Telugus, the Punjabis also for same. Muslims are probably the worst victim of this discrimination. But it is a problem that warrants action from the government, as well as the society. Unfortunately the celebrities are happy in their cocoon of comfort and when they get a feel of real life, they get hurt. And when they speak up, it becomes an issue for a while. But after a couple of days of discussions on TV channels and editorials in newspapers, everybody will once again forget it. We, Indians, are known for the 'chalta hai' attitude. We don't want a Keralite! A Malayali family was about to shift into their new house when they received a call. The lady who called up had the guts to ask the family, to find a house somewhere else. The Malayali Hindu family was flabbergasted. How can someone has the audacity. This happend to my friend. His sister, who was naturally angry, blasted the lady. Incidentally, here the houses were located at a distance, as it was not a multi-storey building where flats are often too close. Incidentally, the lady who made the phone call was Jain. So here it was a member of majority community ie Hindu Malayalis asked to remain out of a society. It is also an example of biases. Now. Back to Emraan Hashmi*. Yes, he can afford to buy flats and pay huge rents. So he is probably not a sufferer in that sense. Because the real victim is the one who can't pay higher price and wonders whether he should take his family to footpath when he doesn't get a house on rent due to his religion. They are the real sufferers. Well, at least eight out of ten persons will refuse to give their house to a Muslim. It has been a personal experience. If they are polite they will say that they can't accommodate a non-vegetarian. Some are direct and say it on your face. You feel humiliated and rejected. For cine stars, this sort of rejection is rare and this hurts their ego. However, the communal division in cities has worsened in the last two decades and it needs to be tackled seriously. It may be harsh on Hashmi but someone may ask where was Mr Hashmi, when others were discriminated or persecuted in his own city and backyard. Others may include Muslims in Gujarat carnage. Wasn't he a Muslim then? Why he didn't speak for other 'victims'. The others would include Christians who were attacked in Orissa or say North Indians getting beaten up in Maharashtra and Dalits facing atrocities elsewhere. True, most of the people speak only when they face a problem, else they don't bother. Also, there is a right-wing line that if you speak of bias, you are playing the 'minority victim card'. That's also unfair. Everybody is entitled to raise their issues, especially when their fundamental rights are curbed. There are some guys who don't like this issue raised at all by a Muslim. The plea is that, 'If there was a bias, how come he became a star. All these years his films were watched and he made moolah but never complained of it'. The truth is that we are a complex society--liberal and conservative at the same time. Muslims may be celebrated as heroes but perhaps, may not be fit for being next door neighbours or acceptable as a son-in-law [Horror!]. Again, it's not for Muslims alone. Apart from castes and regions, [dark complexioned or non-English speakers, just to name a few] also face different sort of biases in various strata of society ranging from marriage to job. The sufferers will continue to suffer and Indian cities will keep getting divided and demarcated among religious lines, unless we all realise, react and raise the issue forcing the government to take a serious note of it. Hashmi has done well to approach the Minority Commission. People tend to be biased but institutional bias is criminal and against the spirit of constitution. We are a multi-cultural society and this is our greatest strength. Bigoted builders and communal colonisers must not be allowed to tamper with India's social fabric. 4. What about ghettoes of caste groups?